As readers of this blog know, the self-help / personal development book genre is one of my all-time favourites and I fear the unstable mounds of books by the side of my bed are about to get even bigger now that I have discovered Watkins Publishing who specialise in precisely this type of book. They very kindly sent me a copy of a fascinating book by Mariana Cooper entitled “The Aha! Factor – The Intuitive Guide For Getting What You Desire & Deserve”. Mariana Cooper is a 3rd generation intuitive, thought leader and visionary mentor who has her own radio and TV shows, as well as hosting telesummits that reach over 85 countries across the world. She has also been an Angel Therapy Practitioner and certified Advanced Medium with Dr. Doreen Virtue for over 10 years and has performed thousands of readings and coaching sessions. In “The Aha! Factor”, Mariana shows us how we use those random, momentary experiences of knowing to get in touch with our “Aha! Factor” – that force which gives us the true direction we want to follow and which is best for us. We’ve all had those “gut feelings” where something doesn’t feel right. Haven’t you sometimes met somebody and just known they were either a friend for life or someone to avoid at all costs? It would be very handy if we could tune into these feelings and come up with a strategy to use this inner knowledge to benefit us. Mariana clearly outlines the tools we have at our disposal to do just this. She teaches us how to tap into our own Energetic System of Communication (ESC). – our capacities to receive and perceive both physical and energetic information in combination with each other so that we can navigate our world with greater ease. 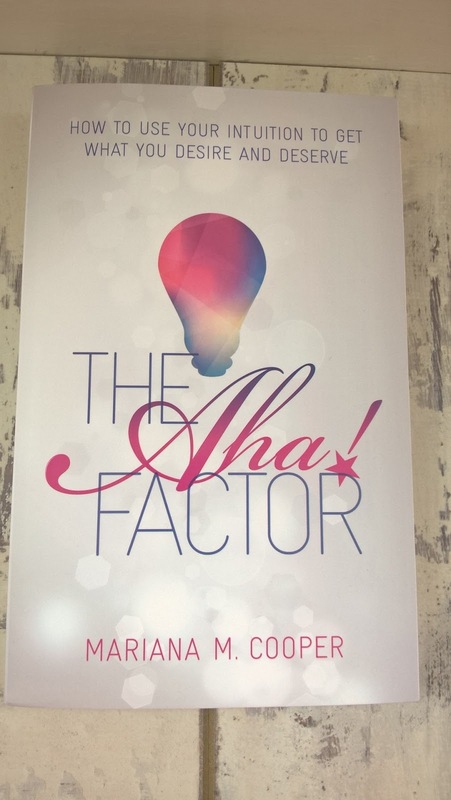 One of the most chapters I found most interesting was one of 50 easily recognisable signs and symbols which help you to know that you are in touch with your Aha! Factor. The world whispers to us in many ways if only we would tune in – and that is what this book teaches us to do. I really enjoyed it and you can buy a copy at Amazon.co.uk. I also have one copy to give away. Just enter via the Rafflecopter in the usual way. UK entrants only and terms and conditions apply. The giveaway ends at 11:59 pm on Friday 13th May 2016.